Super Pitfall 30th Anniversary Edition. Release 1.0 - 05 Sept 2016. A hack by Nesrocks. 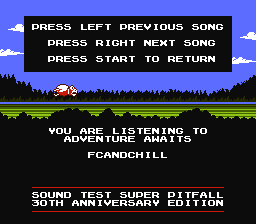 New soundtrack by FCandChill. Pitfall II arrangements by rockman_x_2002. 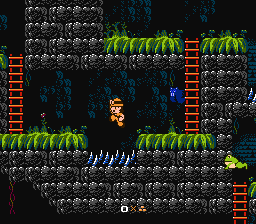 This hack was created in celebration to 30 years of Super Pitfall. It vastly improves the original game while keeping the base game and level layout intact. The idea was to modernize, fix and beautify the original game because the author felt like the game’s problems kept it from getting justice. Seamless, fully automatic save feature (please hold reset while shutting down when playing on a repro cartridge to avoid save file corruption). Please read the readme for full credits and special thanks. Copyright: DO NOT modify this hack in any way. Keep credits where credits are due. The hack contains original artwork. 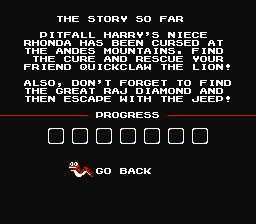 The unmodified game Super Pitfall is the property of Activision. 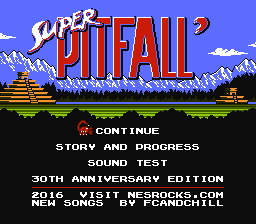 Ahh Super Pitfall one of the worst game ever made become very huge improved by Nesrocks in this hack as “Super Pitfall 30th Anniversary Edition”. The graphics was altered and recycled. 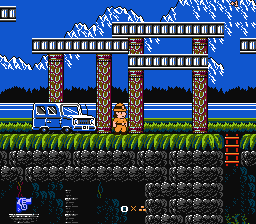 The music was more arranged, new and no longer muzak-y in original game. The save features keeps track you data and you be able to continue where you left off. No more cryptic parts. Rebalanced gameplay. Anyway. Come on let’s grab this patch now, massive improvement!